Apple iPhone 4S LCD and touch screen replacement in white. 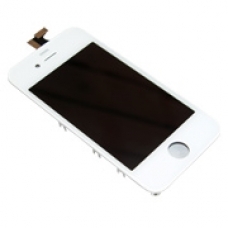 This white iPhone 4S screen comes complete with the LCD and touch screen, if you have broken your LCD or glass touch screen or both this is the correct white iPhone 4S part, this complete screen makes replacement of the part on your iPhone 4S straight forward and fast. * High Quality Screen Assembly for White iPhone 4S. * Includes White Outer Mounting Frame.